The time is ripe and the alarm has rung for a Playtime Bingo. If what you like is bingo to the fullest extent and robust games then settle in for some play action. Find that cozy little nook in your home and pamper yourself, after all you deserve it. Remember when playtime consisted of girls pulling out their Barbie dolls and boys doing battle with their G.I. Joes? Now that we are adults playtime is a whole different level of entertainment. Online Bingo is taking the Internet by storm and the popularity is increasing by leaps and bounds. 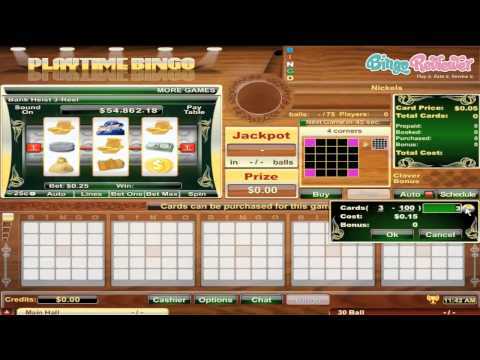 Playtime bingo is one of those premier gaming portals you won’t want to miss. The homepage features a clock advert that has a semi live form. With teeth that resemble a mouse, players may wonder if the alarm goes off or those teeth give you a nibble. The color scheme is forest green with a brown grain wood background. It resembles all the elements of nature and down-home fun. They got there start in March of 2004 and have been on an uphill climb of popularity ever since. Maneuvering is easy even though the homepage tells the whole story without having to register first. Powered by Byworth Entertainment software players know that this is a trusted gaming site offering award winning products. This is downloadable software, but takes only minutes to get started. How many times have you joined a bingo site to only be disappointed because they didn’t offer the bingo game you were looking for? This won’t happen at Playtime Bingo because they have covered all the bingo bases with not one but four variations of the game. Players are singing their praises with 90 ball, 80 ball, 75 ball and 30 ball bingo. There are so many games with so little time. If the Playtime mascot clock is ticking too fast for you then 30 ball bingo is a perfect choice. It is the quickest game you’ll ever play with the same great prizes as the other bingo variations. Players can enjoy all the great frills they are accustomed to with Chat Games, Side Games and Progressive Jackpots. Roam the lobby and see all the other games of chance including Slots, Keno Instant Games, Video Poker, Blackjack, Roulette, Pull Tabs and much more totaling 50 games in all and lots of Jackpots. Playtime Bingo does not offer a free bonus but they will offer players a nice welcome with a Deposit Bonus on their first deposit. Specials are always happening at Playtime Bingo with exclusives that include Slot Contests and other promotional offers that are interactive competitive games and more. The Playtime Points Program was developed in appreciation of their most loyal players. Every dollar played on Bingo or Side Games will earn each player one point. How valuable are these points? They are very lucrative because they can be traded in for playable bingo bucks. The exchange rate is 250 points per 1 bonus buck. Players must earn a minimum of 1,000 points before a converting them. Your points are updated daily and are viewable so players can keep track. One advantage to the points that some other sites do not have is they will never expire. The promotional incentives are not very generous, particularly for the new player. The variation of 4 bingo games helps to make up for it. We rate Playtime Bingo with 3.25 Pink Hearts. They offer an interesting and unique selection of bingo that includes instant 30, 75, 80 and 90 ball. You can even engage in a game of jingo, which is always a blast! Overall, I was highly pleased with the games they had to offer. There are tons of slots to choose from when you play here as well. One of my favorite games to play is the 5-reel bank heist game. The jackpots here are certainly worth playing for and they can get fairly hefty. They also offer a wide selection of casino-style games which includes favorites like blackjack, roulette, poker and more. Other games like pull tabs and keno can be found as well. The atmosphere here is great, from the other players to the customer support. When I first joined the site, I was a little bothered by the setup. It looks a little awkward to me for some reason but after playing for at the site for a while, I didn’t even notice anymore. Not a bad place, with Byworth software, and although I wasn't that huge fan of it, I did have a good time and won for a few times. The Bingo offer is good, and there are 75, 90 ball games, which are classic and most represented, but also the 80 and 30 ball games. Apart from that, I also played slots a lot, and if you are not satisfied with that, you can always hit the regulars like Poker, roulette and all the other casino games. The site looks decently, and the navigation is fast, so no complaints about that. The starting bonus was not that impressive, and the 100% first deposit bonus just isn't enough to make a difference. Then again, there's a $10 no deposit bonus, and that is a good thing to test the games. I didn't make much out of the first deposit, but the second one kicked in real good. Probably will come back.